When Jughead learns that F.P. 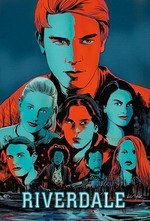 is getting released from prison, he and Betty organize a welcome home party; Archie and Veronica push their relationship issues aside to focus on the Black Hood investigation. As it has been well established by this point, this is a show where the improbable has become ordinary, and the sensible rarely exists at all. Like it's spiritual precursor Twin Peaks, Riverdale will do whatever the hell it wants, and viewers can either hop aboard like Betty on the back of uneasy rider Jughead's motorcycle or tune out entirely. Obviously, we here at Den of Geek are all in, but that doesn't mean to say that the journey is always going to be a comfortable one. Which brings us to tonight's installment, perhaps the most uneven episode to date. While the identity of Riverdale's Black Hood is still unknown, the entire gang continues its quest for answers in this week's episode. Its title, "House of the Devil," might make it seem like this week is all about the town's murderers, but it's actually about something way more devastating: breakups. Prepare yourself for misery, as every relationship on the show seems to fall apart in this week's episode. Pours out 40 for Bughead. WTF strip show, janitor, etc. Teen drama, but amped up to 11. You know, for the sheer CW TV spectacle of it all. That said, Riverdale has made enough of an impact that Marvel Comics did their own Riverdale-esque Archie spoof recently. If you miss True Blood in all its campyness, Riverdale scratches that itch pretty well. That strip show...what the hell. And I say this as someone who's stripped professionally. Is that even legal? Isn't Betty too young? What even was the point of that!? This was probably one of the worse episodes of the season. The second they mentioned the "Serpent Dance," it seemed inevitable that Betty would be taking her clothes off. It would have been nice if she had upended the tradition in how to join the gang. Also, are they planning on having Betty's mom and Jughead's dad hook up? I'm additionally confused by her on and off again embracement of her former "bad girl" life. Per character development purposes, it seems like it's done almost for jokes - while so far, offering nothing to contribute to the overall storyline of the season. Right now, I'm pretty much Team Jughead, as in I just want him to be able to go to Pop's, eat burgers, and write his blog. I reject this episode. Betty's ponytail is iconic and beyond reproach. Let me just say, that is the most effed up song for a strip tease. Yeah, also if they are regularly having underage stripteases at the White Wyrm I’m kind of more down with the “the Serpents are an Actual Problem and not a kindly fun gang” attitude.